Congratulations to Taylah Murphy who won first prize of $1000 in this statewide competition for her idea for a café “Bean Here Before”. Stephanie Lauria and Mihrimah Oztas won second prize with their business idea “XOXO Makeup” sharing the $500 second prize. We are extremely proud of their success in a very strong field of competitors. Many of our year 11 students competed and were asked to come up with an idea and market it to a group of experts – demonstrating a range of skills learned during their Business Management class. The Uni Bridges program is designed to inspire students in the area of science, technology, engineering and mathematics and encourage them to pursue higher education. 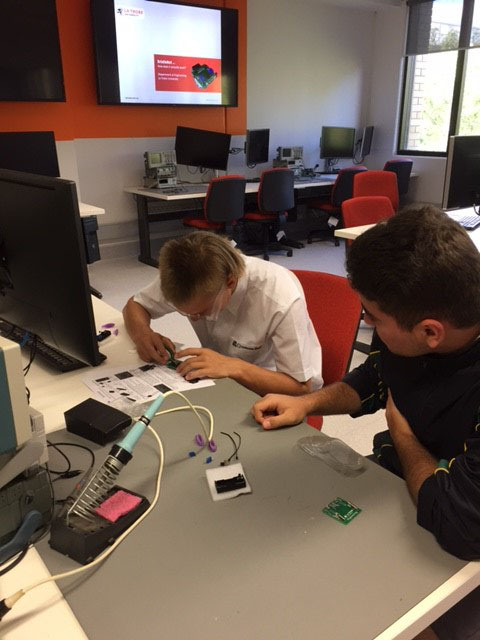 The partnership developed with La Trobe and participating secondary schools allows Uni Bridges students to participate in hands-on laboratory sessions at the University and Quantum Victoria. Specific Uni Bridges curriculum is collaboratively developed and delivered by the partner schools and contextualised to the theme of preventing and curing disease. The program provides an alternative pathway into tertiary studies in the Science, Technology, Engineering and Mathematics disciplines at La Trobe University. Uni Bridges students at Gladstone Park who wish to apply to La Trobe through the Uni Bridges Pathway must complete the Biomaths course at Year 10, present a portfolio of work to a panel during Year 12 and include the relevant course on their VTAC application.